It’s impossible to understand other people’s situations till you walk a mile in their shoes, goes the idiom. If that’s true, Jacki Barnett must have hiked thousands of miles in memory of her late friend Christy Levy Peters. Jacki is one of three founders of In Christy’s Shoes, an organization that hosts shoe fashion shows to raise money for non-profits including women’s shelters and more. As Jacki told me during a dinner interview, the budding organization has grown each year, raising thousands of dollars. “It’s been this topsy-turvy ride since Christy passed away, but then I look at what we have built. Out of the worst possible thing that could have happened to us, we have done the most tremendous thing. We get to talk about our friend every day,” said Jacki. 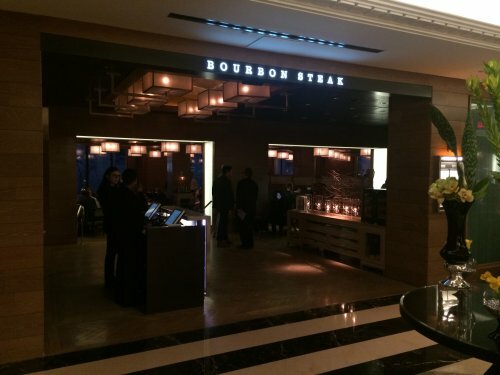 Our interview venue was Bourbon Steak, a lush restaurant on the ground floor of the Four Seasons in Washington, DC’s tony Georgetown neighborhood. Breaking a trend, I found myself early for once. After a few minutes, I got a text from Jacki. She was running late as her Uber driver was lost. Within minutes of meeting Jacki, I was LOL-ing myself. Here’s a woman whose smile is infectious, who buzzes with natural vigor and has a hearty, powerful chuckle that makes you want to laugh along with her. And the best part? She brought me a treat. “Here, I didn’t want you to feel left out,” she said, smiling as she slid me a chocolate Easter bunny across the table as we sat down. Left out? From what? From the massive bag of candy that she’d brought with her. Her husband Adam, a professional chef at DC’s Westend Bistro, is close friends with Bourbon Steak’s Executive Chef Joe Palma. Jacki brought the candy for Joe and his colleagues, explaining that when kitchen staff are flagging on energy in the middle of a service, reaching for Reese’s Pieces or another snack gives them a needed boost. She gave the bag to a waitress, who took it the kitchen. The gift was apparently appreciated, as Joe — who we’d get to chat with later in the evening — sent out two glasses of sparkling white wine before dinner. It wasn’t just me and the kitchen staff that Jacki was considerate about. Throughout the meal she would spark up conversations with the waiters, waitresses and people at other tables, showing a genuine interest in their stories and learning more about them. But I was there to learn Jacki’s story. 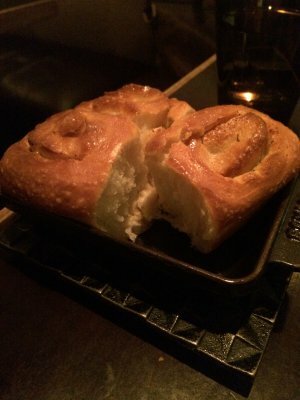 And so, as we polished off our sparkling wine and placed orders for cocktails, I discovered the origins of In Christy’s Shoes. Jacki, 42, was born and raised in Columbus, Ohio. That’s where she met her friends Christy, Christy’s twin sister Katrina Levy Zidel, and Becky Sweeney. As Jacki told it between sips of a Manhattan, Christy was the most vivacious, gregarious member of the group. “I remember her smile, how she’d walk into a room and everyone turned. She was stunning, she had such a presence, everyone wanted to be her friend, and I was one of her best friends,” said Jacki. 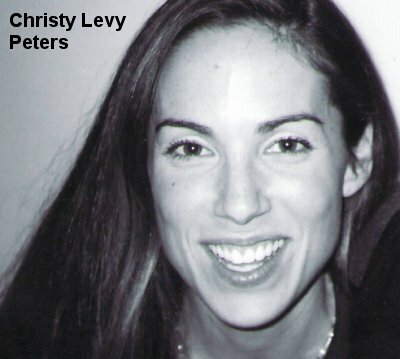 Christy was the type of person who was “willing to help everyone,” be it lending a car to a friend for a few days or giving away “the last dollar bill in her wallet,” says In Christy’s Shoes’ website. In February 2006, Christy — a 33-year-old mother to a then-10-year-old daughter Sydney — was diagnosed with terminal brain cancer. Christy passed away in April 2007. “She was a wife and mother and sister and a best friend, and we lost her too soon,” said Jacki. Although the group of four friends had grown up together in Columbus, Jacki was slated to move to Virginia in 2006 after her husband got a job at the lavish Inn at Little Washington. “But I told him I wasn’t ready to leave Christy,” she said. And so Jacki stayed behind in Ohio to spend more time with her best friend. After about six months, she followed her husband to Virginia. Living south of Washington in “the middle of nowhere” Jacki said she spent most of her time on arts and craft projects. Then came the horrible, inevitable phone call to come back to Ohio for Christy’s last days. The duo spent four hours alone together at the hospice. “Those are the most cherished hours of my life. We had dinner, held hands a lot, read our horoscopes — we loved to do that — and after that night she basically went into a coma,” Jacki said. Even then, Jacki would go and see her friend each morning, taking their favorite breakfast of a cinnamon roll and just sitting with Christy. Approaching the second anniversary of Christy’s death in 2009, the three surviving friends were talking about how they could pay tribute to her. They talked about the fact that Christy loved shoes. “I mean, all women love shoes, but her collection was like Imelda Marcos. It was insane,” said Jacki, laughing heartily. The next step was figuring out what to do with shoes. They realized that they all had a lot of shoes in their closets that they never wore that were usable, and thought about having a fundraising luncheon, auctioning off shoes to raise money for charity. They put together the event at the home of Christy’s grandmother as close to the date of Christy’s passing as possible, collecting shoes for Dress For Success in Columbus, a non-profit that provides interview clothes and career development to low-income women. The event was a huge success, and so in 2010 they teamed up with local restaurants and shoe store DSW to provide catering and donated shoes, respectively, for a shoe auction. It raised more than $10,000. They decided any money raised would go to Dress For Success in Columbus, a non-profit that provides interview clothes and career development to low-income women. From there, the events got bigger, with a 2011 shoe auction at the Saks Fifth Avenue store in Columbus. “We saw In Christy’s Shoes getting bigger,” said Jacki. And so the organization grew, expanding so much that in 2012 they needed the space at the Columbus Audubon Center in order to host the 300-plus attendees. “Everyone loved it and we raised thousands,” said Jacki. Since 2013, the events have been held at the St. Charles Preparatory School in Columbus. Successful parties are all well and good, but the friends are looking for more than that. They’ve got goals for the future, but before Jacki could tell me about them, our waitress was back with two bowls of soup we hadn’t ordered. But this was no mistake. “This is Joe spoiling us,” said Jacki, smiling in appreciation. 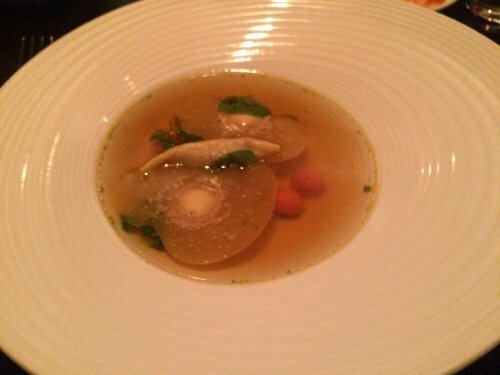 The soup was an off-menu chicken consommé, a surprisingly light soup featuring vegetables and a little pillow of pasta stuffed with tender poultry. Amazing stuff. She paused as our waitress set down some black truffle bread rolls to chew on. Delicious. Warm, soft and with just enough truffle flavor to not be overwhelming, they were a great snack. While I gorged on them, Jacki elaborated on her plans for the future. Every year Jacki sets herself a goal of making the fundraising, the shows, and everything else associated with In Christy’s Shoes bigger and better than the year before. She does that not only to pay tribute to her late friend, but also to help others. “Christy’s passing opened up our eyes a lot more to what is going on around us and how we can help others,” she said. In the fall, Jacki plans to reach out to veterans’ groups — which she sees as synonymous with the heavy military presence in the DC area — to see who might benefit from the financial help that In Christy’s Shoes can bring. And then came the main course, with more surprises. 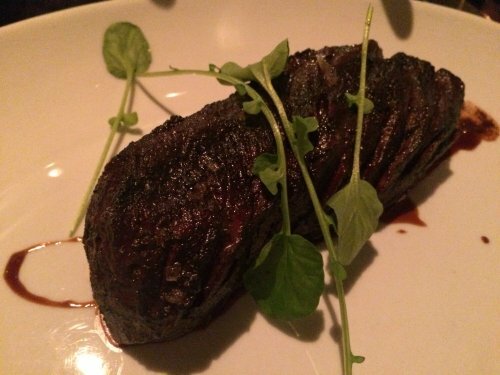 Both Jacki and I had ordered the 10 ounce Angus hanger steak, and they came out perfectly cooked. 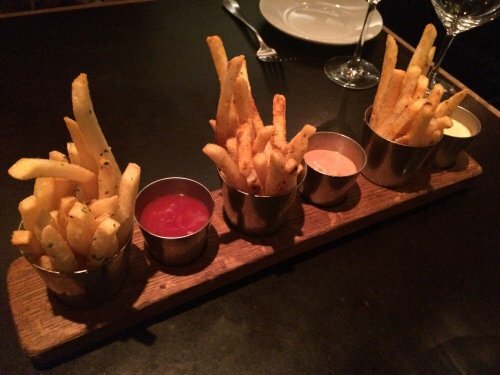 The meat was accompanied by sides that we’d also chosen, starting with a selection of fries done different ways, served with three different sauces including house-made ketchup. 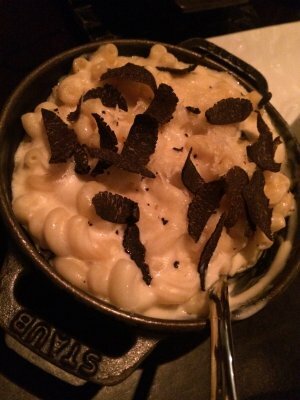 With the steak we also opted for the black truffle mac and cheese, which was so richly indulgent — in a good way — that I was only able to manage about three spoonfuls of it. 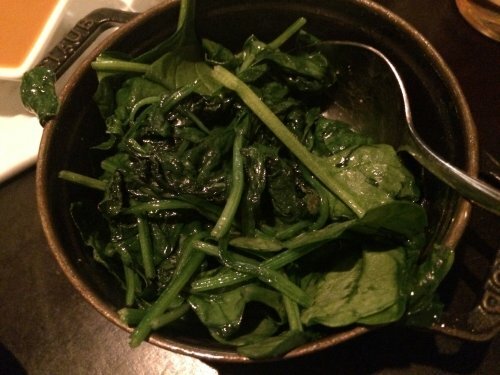 Finally, our order was topped off with some sauteed spinach. Important to get something vaguely healthy among the calorific feast that we’d embarked on. But there, in the middle of the table, was our next surprise. Chef Palma had sent out five slices of prime Japanese Wagyu steak. The high price of this top-quality beef was enough to keep me away from ordering it, but I leaped at the chance to try this small sample. And it was outstanding. 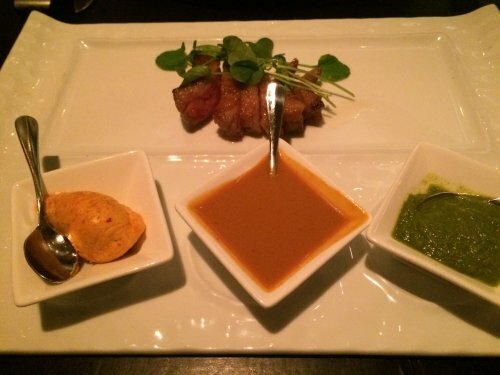 The tender meat had a melt-in-the-mouth quality, which is something I’d never have thought one could say about steak. As we made our valiant efforts at attacking the mountain of food, I told Jacki I was curious about the highs and lows of establishing In Christy’s Shoes. Everything I’d heard so far spoke to what seemed like a flawless launch and easy growth. But were there hurdles to overcome? Logistics was one of the first problems, given uncertainty about where and how to host an event — resulting in the party at Christy’s grandmother’s house as the most viable solution for the debut fashion show. And planning can sometimes cause headaches, with Jacki saying the event at the Audubon Center was a nightmare to host — but still turned out well. “But the worst parts for me are the small moments of panic when I haven’t heard from a sponsor I was supposed to have heard from two days ago. They’ve verbally committed but I don’t have written commitment,” said Jacki, adding that the uncertainty can be stressful. “How do you send a gentle note to them? Hearing ‘no’ doesn’t bother me,” but the silence can, she said. Pitching to companies and others to sponsor events for In Christy’s Shoes means Jacki is always talking about her deceased friend. Is that difficult? So the friends focus on glamor and fun, raising money along the way. “The best part is giving the money away. It’s so rewarding to know that after all our efforts, we get to help others,” she said. Although Jacki maintains a lively, upbeat attitude, she said that it was initially a struggle to launch In Christy’s Shoes in Virginia because most of her support network and friends were back in Ohio. But she has her husband Adam, and friends like Chef Palma, who came over to our table. He sat with us for a few minutes and asked our feedback on the meal so far. Our response was universal praise. Then I sat and observed the easy small talk that Jacki and Joe made, cracking each other up with inside jokes, and showing a close, warm friendship. 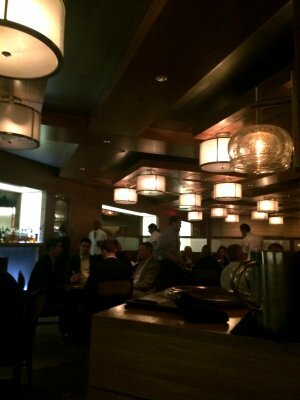 But there were other diners to take care of, and so the chef excused himself. 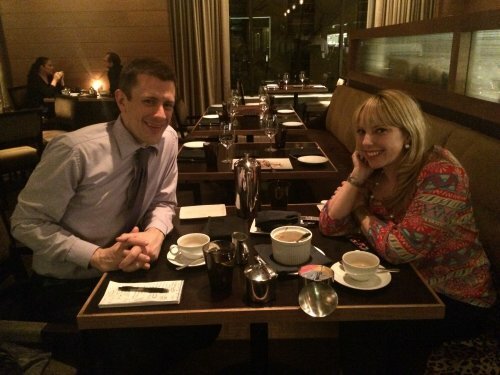 Before he did, he promised to fix us some dessert — even though we were feeling full. It was impossible to turn down his kind gesture with the last course. Moments later, I think both my eyes and Jacki’s eyes bulged out our sockets, cartoon-like, as the final treats of the night arrived at our table. 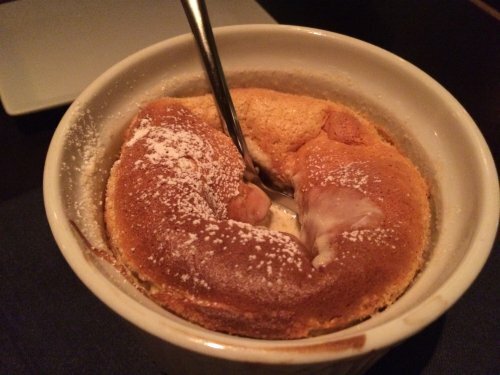 First up was an “old fashioned”-flavored souffle with crème anglaise and a pistachio biscotti. I only tried a single spoonful, but this was as rich and delicious as the other dishes. 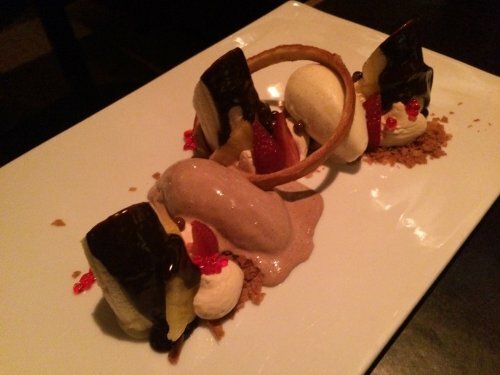 But my attention was devoted to Bourbon Steak’s take on a banana split. Sliced chunks of banana were covered in hot fudge, malted whipped cream, strawberries, vanilla and chocolate ice cream, topped off with a salty, crunchy circular pretzel. If any dessert deserves to be called “moreish” it’s this one, and I couldn’t resist returning to it. Our final dish of the night — and one neither Jacki nor I could really touch, but due to full stomachs rather than disliking it — was the Bourbon chocolate bar. It’s a hefty rectangular slab of caramelized chocolate mousse, topped with peanut butter powder. 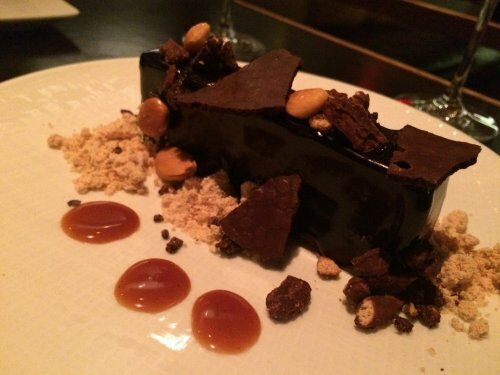 The decadent flavor of the dark chocolate matched perfectly with the peanut. This dish alone would satisfy two diners splitting dessert. Jacki suggested I take it home with me, and I obliged even though eating it would mean having to put in 1,000 hours at the gym. I’d told Jacki earlier that over the past several months I’d shed 15 pounds. She looked at the demolition derby of plates strewn across our table and laughed. “This is a real treat, it’s probably good you don’t bring me on interviews because there goes that 15 pounds. You’re going to have a lot more breakfast than that Easter bunny,” she said. Ah, the bunny. I’d forgotten about it. I had that to eat as well. Jacki’s generosity and warm character made for an incredibly enjoyable meal, stretching almost to the three-hour mark. Much of the conversation veered off-topic and should probably remain off the record, but every single moment spent talking with her was full of interest and laughter. I’m sure she applies her winning personality just as well for In Christy’s Shoes. When she’s not working for the organization, she has a part-time job tending bar at the Liberty Tavern in Arlington’s Clarendon neighborhood. She loves the social aspect of that job, and the owners are happy for her to talk with customers about her charity.